It is a well-known feature of Physical Cash which allows users to spend eCoins just received from a payment – without having to contact any third party in-between. We refer to a transferable payment as a transfer if the payee can use the received eCoins in a subsequent payment. Transferability, reusability or off-line multi-hopping is the ability to pass eCoins from one device to another without contacting anybody. A payment system is transferable if it allows at least one transfer per eCoin. The initial withdraw from the bank and the final payment deposit done at the end of that chain is considerable not counted a transfer. A transferable electronic cash system is off-line by definition since on-line systems require communication with the eMint (bank) during each payment. fairCASH eCoins in their transferability life cycle between eMint and economy. In our figure, we see issued eCoins will be recorded in the eCoin database (blue) maintained by the eMint for security and auditing purposes. eCoins contain only little more information than a serial number, value and currency indicators, and expiration fields. All eCoins issued will have such an transferability-expiration date. If that date has not been reached the eCoins have full transferability (green); they are free to be transferred among the users. If an eCoin expires, its transferability is reduced to a limited state (yellow) and it can only be deposited at the eMint, but not any longer used in the open loop. The user can very easily exchange his eCoins against new ones from eMint, resetting the state of full transferability. 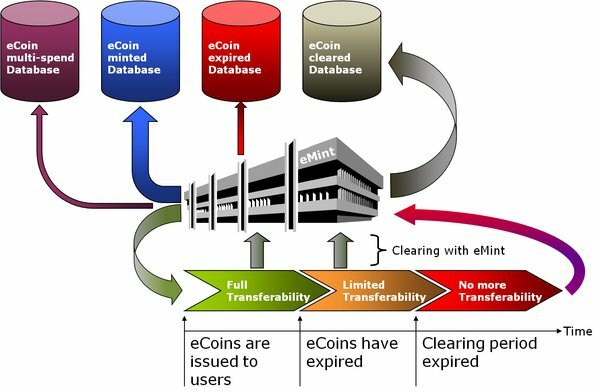 It is up to the eMint policy to phase out already expired eCoins (a space of time defined by the eMint during the minting process) handling them separately from the normal clearing process. This is indicated by reaching the (red) state of no more validity. These eCoins are considered useless: they will not be cleared at all. Nevertheless, these eCoins are thrown in the ‘eCoin expired database’ (red). The circulation diagram shows the various states for an eCoin. After redeeming them to the eMint, the clearing instance will first contact its 'eCoin minted database' (blue). If the deposited eCoin is in that database, it is the first time the eCoin has been presented. The eMint will delete it from that (blue) database by transferring the entry into the 'eCoin cleared database' (grey) and pay the depositor the equivalent amount (by using physical cash, a bank account or any other possibility). If the deposited eCoin cannot be found in the (blue) database the eCoin must have been cleared previously. This can be confirmed by finding it in the ‘eCoin cleared database’ (grey). This represents a security breach and the serial number will be recorded in the 'eCoin multi-spent database' (purple). Its content either can be disseminate in the form of a Certification Revocation List (CRL) or through a direct online eWallet check with the eMint, issued as a security measure. The eMint must then investigate this potential fraud to decide whether to reimburse the depositor. Transferable electronic cash systems are more efficient than others are because they require less interaction with the bank. Some transferable eCash systems described in literature have a property where the eCoin "grow in size" (i.e., accumulate more bits) each time it is spent, which is indeed not the case with fairCASH eCoins.